With offices in Munich, Berlin, Hamburg, Stuttgart and Hamm B.A.U.M. Consult GmbH supports enterprises, municipalities, regions and governmental institutions throughout Germany and abroad with consultancy and training on sustainable development. As a knowledge management company, B.A.U.M. understands its role as a link between development, production and marketing of sustainable products and services. B.A.U.M. supports enterprises to develop sustainable and environmentally-friendly products and to win market shares for their offerings with marketing campaigns, helps enterprises and municipalities to establish environmental and sustainability management like ISO 14001 or EMAS in their respective organizations. Through its Regional Development Department, B.A.U.M. helps to build regional market and branding systems with emphasis on local food and energy provision. B.A.U.M. manages research and development programs and organizes conferences and experience exchange events on behalf of governmental and entrepreneurial organizations. The B.A.U.M. International Department is partner in various EC projects. It helps other companies and local governments in the application process for EC and worldwide funding and with coordinating huge projects. In international projects, scientific studies and regional development B.A.U.M. today concentrates on fostering usage of local renewable energy sources and sustainable mobility patterns. 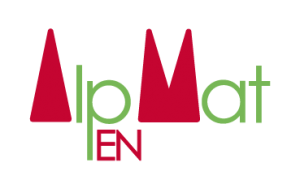 AlpEnMAT project is developed within the Alpine Space Programme 2007-2013, co-funded by the European Regional Development Fund.